Meet World Famous Pipe Makers ! Meet Pipe Shop Owners and Tobacconists ! Trade, Sell or Buy Pipes, Tobacco, and Accessories. Have that old pipe collection in your attic appraised. Learn more about the Great Northern Pipe Club. Chat with experts about pipes and tobaccos. Bring your pipes and enjoy great discussions with friends. Open to the public. Free Admission. Anyone 18+ welcome. Congratulations Dave Soucy, our new Club President. Dave will assume his duties officially on January 1st, 2018. Mark Barsness was also re-elected as club Vice President. Gregg Nelson will continue as Secretary/Treasurer and John Enger will continue as Communications Chair. Together, we have a great leadership team to take our club to the next level. We are accepting nominations through December 15th for Club President. We will be holding the election at the December meeting (Dec 16th) at Noon at the Perfect Ash. To nominate someone, please e-mail info@greatnorthernpipeclub.org or you can make the nomination in person at the November or December meetings. Frank Storm, long time club member, tobacco store owner and owner of “Restoration Pipe Repair” has announced his retirement effective August 1st. He has many pipe stems (both Lucite and Vulcanite) for sale at 50% cost. We wish Frank the best as he embarks on his retirement plans. We are excited to announce that 2017 Club Pipe of the Year is being carved by Marco of Moretti Pipes. The pipe will be a Canadian style pipe dedicated to the memory of Tony Soderman (founding club member who passed away in 2016). It will have a black acrylic stem (note the photos show a swirled Lucite stem), black rusticated finish, with a smooth rim. Specs: Length: 6 3/4 to 7 inches, Height of bowl: 1 7/8 to 2 inches, chamber dia: 13/16 in. 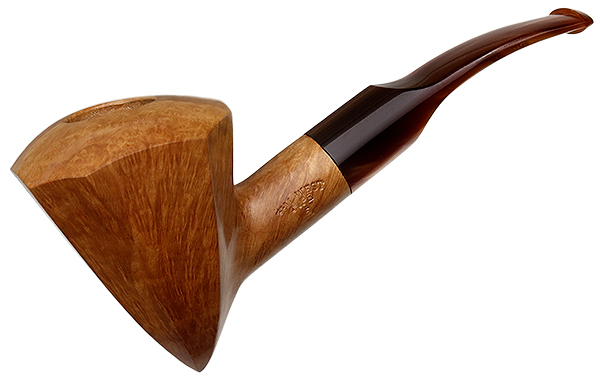 The pipe can be purchased by all current club members (in good standing on dues) for $175 with shipping included. Order deadline, including full payment is January 20th, 2018. It’s with heavy hearts that we deliver the sad news that club member Tony Soderman has passed away due to complications of recent health issues. Tony was a driving force of our pipe club since it’s inception and served as our club President for many years. Tony was known world-wide for his commitment and knowledge of pipes and pipe collecting, pipe history and developing strong relationships within the pipe collectors community. He will be dearly missed. Come join us at the Perfect Ash for a Remembrance and celebration of life for Tony Soderman. Please bring your favorite “Canadian” to smoke and you are encouraged to bring photos and stories of Tony.